Keep your pet cool for the hottest times of the year with the 14-BFB-001B Pet Cooling Pad by ZooVaa. During summer months and excessively hot days pet owners need to remain cautious of their pets being at risk for heat related injuries. Dogs cannot sweat, making them less effective at cooling themselves in high temperatures. The pet cooling mat for dogs and cats uses non-toxic cooling gel and heat dispersion technology which keeps the mat cool to the touch. Once your dog or cat lays down on the high-density mat, the gel absorbs heat and disperses cooling gel. The self-activating gel interior requires no water, refrigeration, or freezing keeping it low maintenance. Your pet will instantly feel the cooling sensation, similar to laying on in-home tile floor, keeping them chilled and relaxed. Easily wipe the mat with a damp towel to clean any dust or debris. The puncture-resistant exterior resists tearing and will remain durable for many uses! Compact sizing is preferable for small to medium size dogs. Help your pet stay cool for the summer with the Pet Cooling Pad by ZooVaa. SAFE COOLING TECHNOLOGY: Safe for sensitive skin. 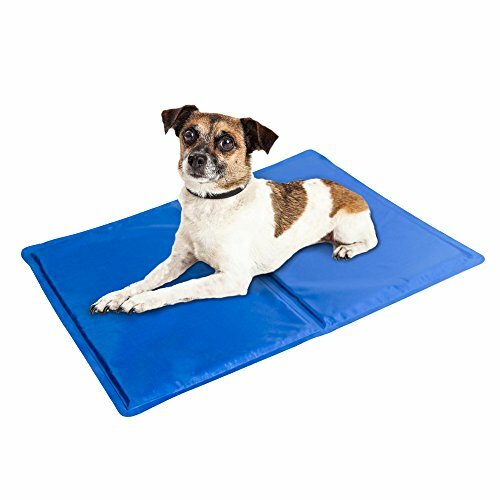 This pet cooling mat for dogs and cats uses non-toxic cooling gel and heat dispersion technology which keeps the mat cool to the touch. NON-TOXIC, SKIN FRIENDLY MATERIAL: Non-toxic gel is safe for dogs in case of accidental ingestion. Attractively designed vinyl helps cool your dog and comfortable. EASY TO CLEAN: Easily wipe the mat with a damp towel to clean any dust or debris. The self-activating gel interior requires no water, refrigeration, or freezing keeping it low maintenance. MULTIPURPOSE PET CARE: Once your dog or cat lays down on the high-density mat, the gel absorbs heat and disperses cooling gel. If you have any questions about this product by ZooVaa, contact us by completing and submitting the form below. If you are looking for a specif part number, please include it with your message.